The 10 Best Places for Fried Chicken in North Dakota! 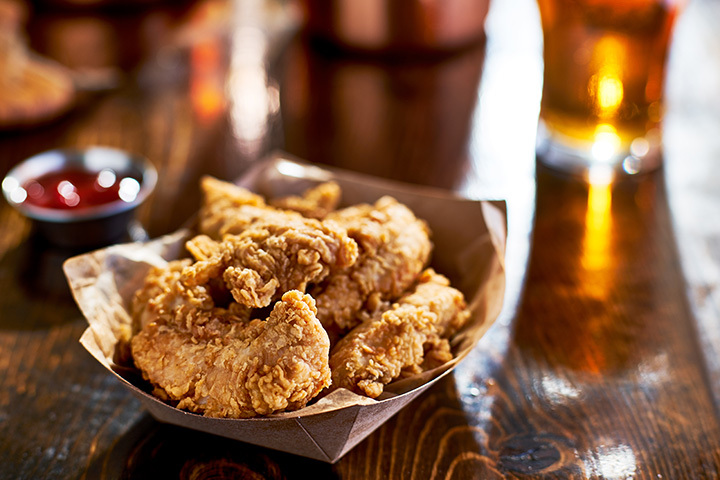 There is something about fried chicken that is comforting. It is a food that is often brought to gatherings or get-togethers, and it is almost universally enjoyed. Who doesn’t like a nice piece of fried chicken? Although your mom or grandma might have a delicious recipe, there are times when you will want to go out and treat yourself to that crispy goodness. The following restaurants have the best fried chicken in North Dakota. A grocery store on the list? If it is Hornbacher’s, yes. Their deli serves up golden friend chicken that is as crispy on the outside as it is juicy on the inside. Single servings or large amounts are available, and the deli has all the sides you could ever want. Sometimes small-town bars have the best food and drink around, and that is the case at the Wild Rice Bar & Grill. Their deep-fried chicken can be purchased as a basket or meal, depending on the size of your appetite. Either one will be delightful. Another head scratcher would be the concept of buying chicken at a gas station. Such food normally conjures up images of stale, greasy food that is only eaten if all other options have been exhausted. That is not the case at M&H, however. Their chicken is always made fresh, crispy, and juicy. Give it a try and you will be more than surprised. The fried chicken at Pizza Ranch is too good to leave out. Known for its pizza and chicken, the restaurant prides itself on fresh food made to order. The only problem with the buffet-style restaurant is that your eyes will always be bigger than your stomach. The Ground Round is known for its affordable yet tasty meals. Its fried and grilled chicken entrees are no different. Don’t fill up on the free popcorn beforehand because you will want to save room for all the chicken you can get. It is that good. Whether you order fried chicken as a meal or as part of the buffet, you will fall in love with it after the very first bite. Golden brown, crispy, and juicy, mouth-watering chicken at its finest. Schatz Econostop is a family owned and operated restaurant that is perfect for a traveler on the go. Service is personal and fast and the fried chicken is delightful. In fact, it is so good you may order another helping to go. Although Big Boy has a few locations across the country, the only place to find it in North Dakota is in Bismarck. Their fried chicken breast is hand battered in the restaurants signature southern chicken breading and deep fried. Even better, it is served with mashed potatoes and turkey gravy. Delicious indeed. If you are looking for the closest thing to homemade, stop by Frieds Family Restaurant. Their menu is vast and everything is cooked by hand. The friend chicken is honey-breaded and deep fried. In other words, it is amazing. The Depot Café serves a variety of delicious entrees, including fried chicken drummies. If you have never had a drummy, you are missing out. Although small, they are gigantic in flavor. One bite of a perfectly fried drummy and you’ll be hooked forever.